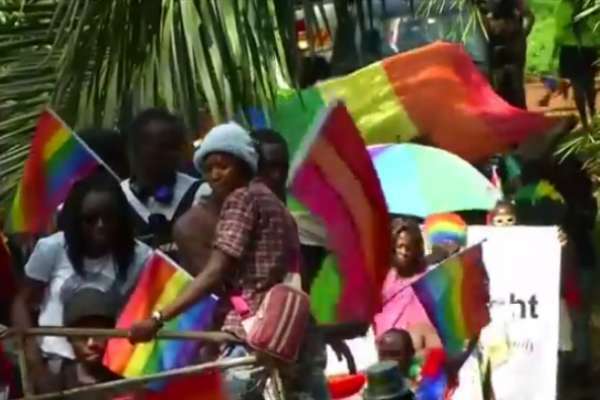 Roughly 70 people attended a Gay Pride march in Kampala, Uganda on Saturday. According to Reuters, the location of the celebration – a secluded beach in Entebbe, on Lake Victoria outside Kampala – was kept a secret until the last minute due to security concerns. Revelers waved rainbow flags and banners as they marched a short distance. The event comes roughly a year after a constitutional court threw out on a technicality one of the harshest anti-gay laws on the continent. But the victory might be short lived as opponents have vowed to introduce a new bill. “[The event] is about trying to show the wider community that violence, discrimination, harassment, stigma against LGBT people is bad,” activist Moses Kimbugwe told Reuters. Activist Sandra Ntebi questioned the need to hold the march in a secluded location. “Who am I showing that I'm proud, because we are celebrating to our own selves,” she said. Another marcher, identified only by her first name, Mariam, said she would “never ever” come out to her parents or friends. “They would denounce me,” she said.